Make a realistic faux oil lamp from a candle, an old glass light shade, a plastic lid and other recycled household bits and pieces. Look carefully, and you’ll see that common recycled objects are the basis of this faux oil lamp and the varying designs are endless. The base of the original design, shown at right, is an outside light fixture glass globe and a couple of bottle lids glued together and painted black. Shown below is a reader’s version, using ivy bowls as the base. 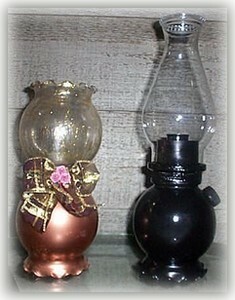 We hope that you are inspired to try your own variation of this faux oil lamp. Make a test run of the lamp design before you glue the pieces together. The glass oil lamp shade should just fit inside the metal pickle jar lid . If it doesn’t, then use a mason ring, or another jar lid that fits snugly but allows you to remove the shade to replace the candle. Place the glass globe light shade upside down, with the opening flat on your work surface. Turn the plastic mayonaise jar lid, flat side up, over the top of the globe shade. Place the metal pickle jar lid, flat side down, on top of the mayonaise jar lid. Position the candle in the paint spray lid to form a candle-holder, using tin foil scrunched around the candle base to keep it secure. The foil also acts as a way to catch melting wax. Place the candle, in its holder, on top of the mayonaise jar lid. Position the glass oil lamp shade over the candle. Now heat the glue gun and begin by gluing the mayonaise lid to the inverted glass globe light shade. Next glue on the pickle jar lid. If you like, you can also attach a small aspirin lid to the glass globe as a faux inlet cap for oil. Make sure all elements are securely glued. Spray paint the new base (globe, mayo lid and pickle lid glued together) in flat black. When dry, place the candle, in its holder, on the base. Light the candle, and add the glass oil lamp shade.